Shopping for Twin Peaks Pin Mates? She's the Log Lady… and she brings her Log! Margaret Lanterman is now a retro-styled, 2-inch scale Pin Mate™ wooden figure! Based on Showtime's highly anticipated television series TWIN PEAKS. What advice or vision does she have for you today? 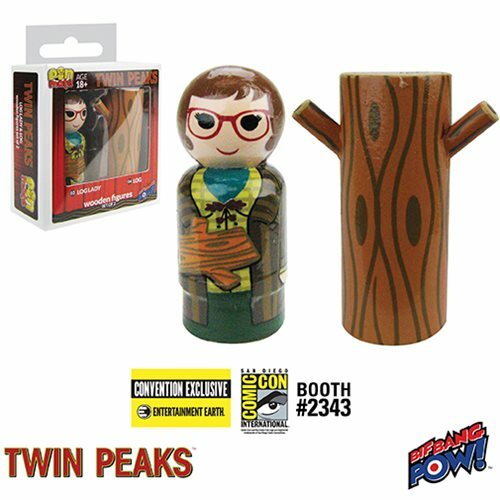 Fresh from Showtime's highly anticipated television series TWIN PEAKS, Margaret Lanterman makes her Pin Mate™ debut in this Twin Peaks Log Lady and Log Pin Mate Wooden Figure Set of 2 from Bif Bang Pow!. These adorable retro-styled, 2-inch scale wooden figures are individually numbered within the Twin Peaks Pin Mate™ series. Log Lady is number 3, and Log is number 4. They feature highly detailed, brightly colored, 360-degree hand-painted artwork with limited decal elements. Plus, as an Entertainment Earth Convention Exclusive, each set is individually numbered on a holographic sticker. Ages 18 and up.